What will beacon technology 2017 be capable of? Is this the year beacons explode? Seven experts share their insights. Beacon Technology 2017: What’s Coming Up in Proximity Technology? what’s next? What can we expect before 2018? 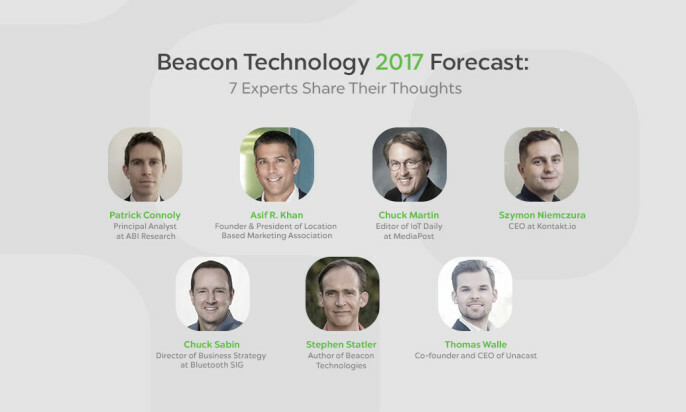 Seven top names in beacons, tech, and marketing share their expectations for what beacons will bring in the new year. In 2016, beacons made the clear shift away from retail and into other verticals. What’s next? What will be trending in beacon technology in 2017? While these are not strictly beacon technology topics, big variables in retail next year will be the arrival of handset-based indoor location from Apple and Google, the beginning of the end for native apps with Google Nearby, PWA etc., and retailers waking up to the true potential of in-store customer analytics and the ability to support retargeting/attribution. All of these represent a big opportunity for beacons in 2017. Personally, I am interested to see if Apple decides to update iBeacon, which has actually been a major inhibitor to the market thus far. The other major shift we expect to see in 2017 is the arrival of software-based beacons and its near neighbour virtual beacons. 2017 will be the year that mobile payments finally become the norm! This will be driven by location/proximity based payment technologies like NFC and beacons. Watch for big Chinese players like Alipay and WeChat to partner with big name retailers and brands in the U.S. to get the market moving, with Apple and Android Pay capitalizing on this to make it mainstream by the end of the year. Wider adoption in more places. More devices, from toys to business applications, will come with Bluetooth inside. Many Christmas presents will introduce millions more consumers to location-based connectivity. Rather than being driven by one thing in one place, beacons will be about a million little and new discoveries. Bluetooth is clearly the next big thing in asset tracking, positioning, and monitoring. Companies are going in this direction and the market is trying to consolidate. In industry, we’re going to see more tough hardware. We’re also going to see existing platforms and providers integrate beacons and Bluetooth into their systems. That’s how beacons are going to be integrated into the vertical—through existing providers seeing value in it and starting to leverage it. In 2017, we’ll start to see the beginning of the beacon revolution, which will eventually change the way we live our everyday lives. Corporate/Industrial and personal/asset tracking are set to lead the way in beacon technology. More consumer visible solutions will include indoor location and consumer retail. For the enterprise, beacons will start to play a vital role in increasing productivity and efficiency of office buildings and warehouses. In retail setting, beacons will be used to optimize flow of service and staffing and also deliver coupons to a consumer’s mobile device as they’re passing a specific item of interest. Hospitals will use beacons to more effectively track life-saving equipment and monitor patients. And, even your trip to the airport will be made easier by automatic notifications that let you know which security line is moving fastest or where the closest coffee shop is to your gate. It is clear that the potential is there for beacons, and Bluetooth 5 is set to drive their widespread adoption and implementation. Beyond the maturing application and vendor ecosystem, we can expect plenty of other interesting action in the beacosystem: acquisitions, asset tracking, networks, more accuracy and Google doubling down. Targeting, retargeting, and attribution for advertisers is an engine of growth that will generate huge revenues, but it’s all about scale. Advertisers want to be able to invest in national campaigns. To do that, beacon networks need to grow and they need to talk to each other. They will need to work together to satisfy the requirements from a brand whose products are sold in both stores and want to launch a campaign that covers both. Companies like Unacast aim to satisfy that need. The more beacons networks interoperate, the faster they will be able to grow. Where 2016 has seen a great development in how beacons are used for proximity marketing as well as analytics, we saw a clear trend in Q4 2016 that proximity companies and their brands are now leveraging their unique data for online retargeting, attribution and monetization. The signs are clear that we will see more of this trend through 2017. Will beacon technology explode in 2017? Why or why not? Why do people keep expecting beacons to explode? It is not a consumer product, or at least not primarily. ABI Research expects the market to continue on its upwards trajectory. The area of most excitement is industrial where low-cost, high accuracy beacons can be a fraction of the cost of other RTLS/asset tracking solutions. 2017 will be the year of proving that these technologies can scale. In retail, I continue to hear about large scale beacon deployments planned for 2017. We are also seeing beacons built into access points, LED lighting, cameras, digital signage, vending machines and mPOS devices. Suddenly, there will be a lot of companies sitting on very large beacon networks. One note of concern, the longer it takes for beacons to achieve critical mass in retail, the more opportunity there is for newer technology to eat up the available market. Yes, it will explode in 2017. This will be driven by Apple’s decision to drop the headphone jack on the iPhone forcing more people to naturally have Bluetooth switched on. As more users have this turned on, the marketing/advertising opportunity becomes more appealing to brands. When technologies grow, they tend less to explode one day but rather on one day people notice it is everywhere. Beaconing has been a long time coming. Many thousands of beacons already are in place, many for testing and others in quiet implementations, especially at large retailers. In 2017, at least one large retailer is likely to make its beaconing public to its customers, potentially opening the floodgates to new consumer experiences. Most consumers are unaware of beacons but they will be introduced to more location-based experiences, which will drive the market. Other retailers then will follow suit and make what they’re doing public. We’re going to see growth in terms of beacon ideas and use cases but I’m cautious to think about it in terms of its overall projection. Yes, there will be new stuff but in the years to come, but a fully matured ecosystem will come steadily. Beacons will become even more common and reliable especially in the industrial world, and it’s that increase in successful use cases that will lead to an increase in adoption rates. We need worldwide proof that beacons are big for the IoT. We need to quantify how many people it can help, how much money it can save, and this needs to materialize in studies, papers, and pitch decks. People need confidence in beacons. According to ABI Research, beacon shipments are expected to have a CAGR of 133% from 2016-2021. The current estimate is annual beacon shipments will triple from 2016-2017, and we will see more than 565 million Bluetooth-enabled beacons shipping annually by 2021. Beacons are cost-effective, relatively easy to implement, and incredibly flexible devices. With the advanced features of Bluetooth 5, their potential increases dramatically. Now, with the availability of richer data and location-relevant information, the opportunities for beacons are seemingly limitless. We should expect to see a healthy growth in beacon technology adoption in 2017, but not an explosion. More and more pilots are starting to turn into production deployments. We are seeing a clear set of leaders amongst the new guard of innovative startups, companies like Kontakt.io. We are seeing the applications layer starting to fill out… If beacons provide the operating system for the physical world, having good off-the-shelf apps is going to be key. There is still a way to go in terms of a huge app ecosystem. This takes time. Watch 2017 for the big packaged Enterprise Resource Planning/Supply Chain/Warehouse Management Systems vendors to start to add support for beacons. This will be the key to the explosive growth we can expect to see in 2018. The beacon technology will have a continuous growth like the insights from Proxbook have shown throughout the year. As with any new technology, it takes time to educate the market, but based on the leaps of Unacast´s 66 proximity partners have done in 2016, the massive adoption could happen at the end of 2017 as the technology becomes more versatile. How will Bluetooth 5.0 change beacon technology? We have already “priced in” the effects of Bluetooth 5 into our forecasts for 2017 and beyond. This standard will significantly catalyse the adoption of beacon in new verticals like connected home, condition monitoring, industrial and corporate. With Bluetooth 5 very well suited to the general IoT space, it will also drive adoption of software-based beacons. Bluetooth 5 will significantly catalyse the adoption of beacon in new verticals. I believe that the longer range of Bluetooth 5 will make beacons more viable for large venues like shopping malls, hotels and airports. This will enable not just “proximity marketing”, but more traditional navigation and way finding to work via beacon as well. Beacons have been looking for more range and have been starved for Bluetooth. Better range will introduce more consumers to Bluetooth which, in turn, will make beacon experiences more seamless and available to more consumers. Bluetooth 5 is definitely a step in the right direction. It proves we are no longer just hoping that Bluetooth will redefine IoT. This proves that Bluetooth really will be big in asset tracking. From my point of view, the fact we can begin developing with Bluetooth 5 in the IoT is really the best thing ever. It shows we were right about the technology’s role in the IoT and that it will lead to more powerful industry, by allowing us to build better networks, use more sensors, and generate more value. One of the key features of Bluetooth 5 is an 800% increased broadcast messaging capacity. This enables Bluetooth to transmit richer, more context-relevant data and will redefine the way information is sent. Moving the payload of the advertisement to the data channel allows for more efficient use of the advertising channel to reduce congestion as well as makes better use of all Bluetooth channels. Developers are able to send more context-relevant data with each advertisement for more dynamic and useful solutions. Bluetooth 5 will drive the adoption of beacons, which in turn will decrease connection barriers and enable a seamless IoT experience, meaning Bluetooth 5 will start to move the industry away from the app-paired-to-device model to a “connectionless” IoT where there is less need to download an app or connect the app to a device. Bluetooth 5 will be a useful enhancement for beacons, not a game changer. The increased range of Bluetooth 5 provides a useful foundation for future enhancements as the industry goes beyond RSSI to estimate range and starts to use Angle of Arrival. Unlike RSSI based methods, with Angle of Arrival being able to situate beacons further away increases accuracy. In addition, being able to cover more range from a single beacon will allow a reduction in cost of the infrastructure required to deliver this much more accurate positioning. We’re very excited about Bluetooth 5 and its longer range, higher speed, and better broadcasting capacity. It will enable beacon technology to be taken to the next level by enabling more precise communication between devices, send messages with a broader format as well as to contribute to an overall improvement in the technology. What will 2018 bring to Bluetooth beacon technology? Check out this year’s blog post to find out! Need insight on Bluetooth beacons and tags in 2018 too? Make sure to check out our complete industry report. Well written! Knowledgable info your are putting toward the enhancement in beacon app .. Cool to see beacons being used more for RLTS. I think http://www.airfinder.com is also using the Kontakt beacon. Good views collected from industry experts. Have read some more articles and reports (https://goo.gl/LrR1yo) on Beacon Technology. Next 3-4 years this technology will trend upward.